The corporations that are best placed to benefit from what the World Economic Forum has dubbed “the Fourth Industrial Revolution” - in which technology’s ability to enable human capital becomes the dominant market force - are those that maximize empathy. But where to start? Silicon Valley has excelled at this. Alphabet’s childcare benefits, Hootsuite’s on-the-job napping policy, and LinkedIn’s reading breaks are acts of empathic recognition for an enlightened workforce that realises that job satisfaction goes beyond money. In the words of Tania Missad, director of global brand insights at Mattel, “Millennials are driven by social justice and attracted to brands with purpose and values.” Mattel’s latest Barbie launch was born of the attempt to make their doll fit into this category. Once again, Silicon Valley is the benchmark. Six times as many patents are filed in California than in the whole of the UK. The statistics point to a positive relationship between corporate empathic cultures and ability to innovate. 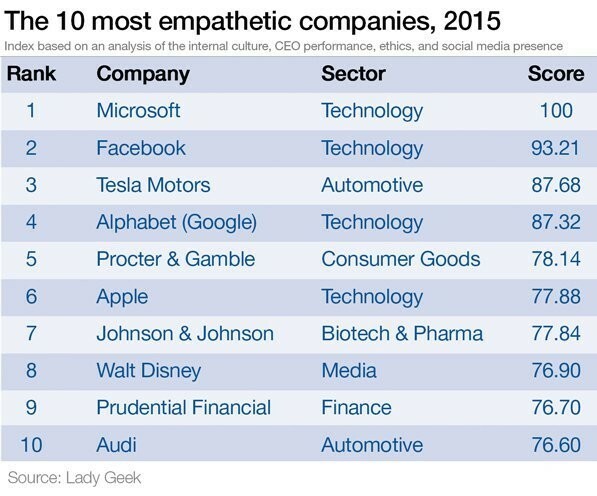 Four out of the top five most empathic companies spent more than $1billion on R&D in 2015. Elon Musk oozes the kind of determination which will convince skeptics to invest in his greenfield projects. Without the man who says he will “never and I mean never” give up, would we have quite so much faith in Tesla motors? The five most empathic companies on the Empathy Index score an average 94% CEO approval rating on Glassdoor, whose ratings include input from past and present company employees. Meanwhile the bottom five in the Index score a lowly 27%. Displays of extreme emotion, whether from fan or foe, are hard for customer service departments. They take us off script, because they fall outside the standard deviation. The temptation is to ignore them (70% of customer complaints directed at businesses on Twitter are simply ignored) or give a robotic response - which can inflame anger. Companies and brands need an ethical dimension – somebody on the board who asks “should we?” instead of just “can we?”. VW (who dropped from 27th in our first Index to 95th in the latest wave) shows even a secret, buried in layers of obfuscated, embedded software, can be discovered. In today’s environment, no secret can hide from an interested public. Belinda Parmar OBE is a Young Global Leader for the World Economic Forum and is the creator of the world’s first global empathy index.